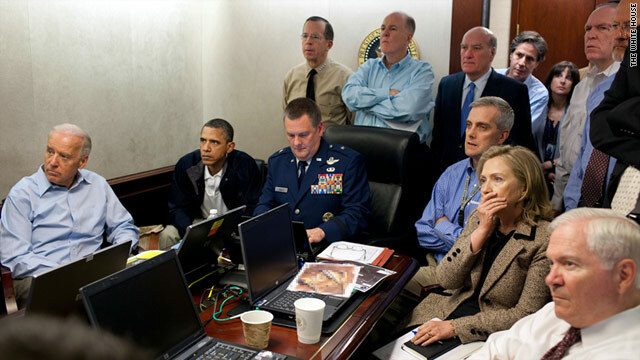 President Obama and his administrative and national security officials receive updates about the attack on Osama bin Laden. (CNN) -- As special-operations military troops prepared for a firefight about 7,000 miles away, President Barack Obama entered a room in the Washington area early in the afternoon on Sunday to follow along. Like a page plucked from a Hollywood screenplay, Obama and other principal coordinators for the mission that killed Osama bin Laden convened in a "situation room" to remotely monitor the situation, John Brennan, the U.S. counterterrorism chief, said in a White House news briefing on Monday. Obama arrived after many of the mission's leaders had assembled there, but the president joined before the attack on bin Laden's mansion in Abbottabad, Pakistan, began, Brennan said. "We were able to monitor on a real-time basis the progress of the operation, from its commencement, to its time on target, to the extraction of the remains," Brennan said. "We were able to have regular updates to ensure that we had real-time visibility into the progress of the operation." The mood in the room was anxious because the stakes were so high, Brennan said. "There were some very tense moments," he said. "We were just saying our prayers that everything would go according to plan." The White House and Central Intelligence Agency didn't have access to a live audio feed, but they were able to tap other communications, a U.S. official told CNN. There was some live video, though the official declined to elaborate on the nature of that footage. The Los Angeles Times reported that the CIA had led the bin Laden attack operation, and officials on the 7th floor of the agency's Langley, Virginia, headquarters had access to live video of the raid, the report said. Brennan declined to say whether they had access to a video feed or radio communications. A White House spokesman declined to comment. Google, Apple and other Internet companies have mastered the process of streaming live video from events to the world. But that task would get much trickier if the cameramen are also carrying rifles and broadcasting from an untested, faraway locale. After Obama had signed off on the operation, CIA Director Leon Panetta gave the official order around midday Sunday for the operation to commence, the Times reported. "We have rid the world of the most infamous terrorist of our time," Panetta said in a statement Monday. "We gave President Obama and his team accurate, relevant, timely intelligence -- providing the information and insight they needed at key points as this mission developed." The CIA had been tracking bin Laden and provided intelligence to the White House saying the agency was "confident" the terrorist leader was inside the Pakistan compound, Brennan said. "It was probably one of the most anxiety-filled periods of time, I think, in the lives of the people who were assembled here yesterday," Brennan said. "The minutes passed like days, and the president was very concerned about the security of our personnel. That was what was on his mind throughout." Shortly after taking office in 2009, Obama had directed Panetta "to make the killing or capture of bin Laden the top priority of our war against al Qaeda," the president said in his speech Sunday night. "We give thanks to the countless intelligence and counterterrorism professionals who've worked tirelessly to achieve this outcome. The American people do not see their work, nor know their names." However, Obama apparently does get to see their work as it's being carried out.